As the October 15 deadline to certify that Iran is complying with the failed nuclear weapons deal it was given by Obama two things are becoming apparent; Iran is not complying with the deal and Obama’s holdovers in the Trump administration will do anything to keep President Trump from fulfilling his campaign promise to leave the disastrous agreement. In our article “Even UN Says Iran Not Complying With Obama Nuclear Weapons Deal,” we explained that the deal Obama made with the Islamic Republic of Iran lacks a specific inspection mechanism in the provision that prohibits the mullahs from pursuing nuclear weapons research. In a stunning example of why Obama’s nuclear weapons deal was tantamount to treason against the United States, unlike many other parts of the deal, the provision, known as Section T, makes no mention of International Atomic Energy Agency inspection or any specifics of how it will be verified. Section T bans "activities which could contribute to the development of a nuclear explosive device". It lists examples such as using computer models that simulate a nuclear bomb, or designing multi-point, explosive detonation systems. The International Atomic Energy Agency (IAEA) has not been able to verify Iran is implementing Section T because the relevant activities would be occurring on military sites and Iran has barred the IAEA from inspecting those sites. This issue has been known for months and is one of the reasons 45 conservative national security experts many of whom held senior positions in the nuclear weapons, arms control, nonproliferation and intelligence fields, sent a letter to President Trump urging him to withdraw the United States from the deeply flawed 2015 nuclear agreement with Iran (the JCPOA) using a comprehensive plan drafted by former U.S. Ambassador to the United Nations John Bolton. The proposed alternative to this blatant breach of the agreement favored by White House National Security Advisor H.R. McMaster and his team of Obama holdovers is to decertify the agreement, but stay in it. The idea of “decertifying” the agreement but staying in it is too cute by half, said Ambassador John Bolton in a September 29, 2017 op-ed in The Wall Street Journal, and we agree, Trump should cut cleanly and get us out. As Ambassador Bolton argued, President Trump’s real decision is whether to fulfill his campaign promise to extricate America from this strategic debacle. Fearing that President Trump will keep his promise, the deal’s acolytes are actively obscuring the central issue, which is American national security, by arguing that it is too arduous and too complex to withdraw cleanly. They have seized instead on a statutory requirement that every 90 days the President must certify, among other things, that adhering to the agreement is in America’s national-security interest. They argue the president should stay in the deal but not make the next certification, due October 15. Ambassador Bolton says this “morganatic strategy” is a poorly concealed ploy to block withdrawal, limp through Mr. Trump’s presidency, and resurrect the deal later. Paradoxically, charges Bolton, supporters are not now asserting that the deal is beneficial. Instead, they concede its innumerable faults but argue that it can be made tougher, more verifiable and more strictly enforced. Or, if you want more, it can be extended, kicked to Congress, or deferred during the North Korea crisis. Whatever. Mr. Trump should not be deceived said Ambassador Bolton. The issue is not certification. The issue is whether we will protect U.S. interests and shatter the illusion that Mr. Obama’s deal is achieving its stated goals, or instead timidly hope for the best while trading with the enemy, as the Europeans are doing. It is too cute by half to employ pettifoggery to evade this reality. As we explained in our articles, Even UN Says Iran Not Complying With Obama Nuclear Weapons Deal, Conservative National Security Experts Urge President Trump to Withdraw From Obama's Nuclear Deal With Iran, President Trump’s UN Speech vs. Action On Iran And North Korea and If North Korea Has Miniature Nukes, So Does Iran, the inevitable result of continuing to falsely certify that Iran is in compliance with the nuclear weapons deal, and allowing their continued nuclear weapons and missile development cooperation, is an anti-American world dominated by two nuclear-armed rogue states; North Korea and Iran. The ayatollahs are using Obama’s handiwork to legitimize their terrorist state, facilitate (and conceal) their continuing nuclear-weapons and ballistic-missile programs, and acquire valuable resources from gullible negotiating partners. 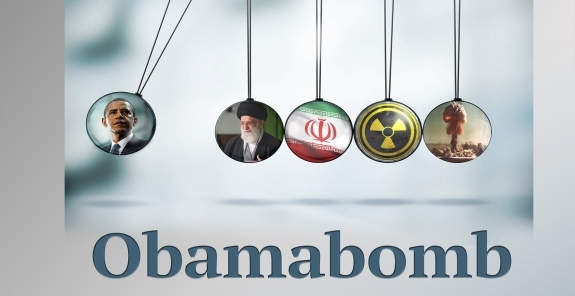 Ambassador Bolton is right, it is time to withdraw cleanly from the Obamabomb deal. The next certification date is October 15, 2017. In the face of all of the Obamabomb agreement’s obvious flaws, recertifying the agreement, but staying in it is, in our view, rank political cowardice. We urge our CHQ readers and friends to contact the White House through this link. Tell President Trump that he must not bow to pressure to falsely certify that Iran is in compliance with the Obama nuclear weapons deal and that it is time to withdraw from Obama’s disastrous nuclear weapons deal with Iran completely and prepare every available option to stop Iran’s nuclear weapons program.